We recently found a hedgehog on our smallholding. This is unusual because it was found during the day, and in February. In the Autumn we discovered a dead hedgehog -that we had also seen during the day in our woods- which we now know was probably underweight. We therefore resolved to actively do something to help this little one. 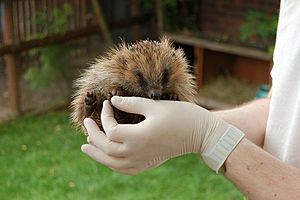 If you have found a hedgehog here is a website with links to organisations who will care for a hedgehog who needs help. The minimum weight for a hedgehog through the winter is 450gms (1lb) and any hedgehog below this weight is likely to have problems. 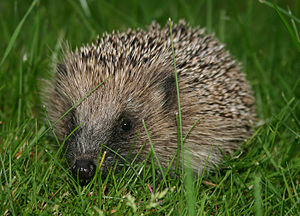 If you find a hedgehog that you are concerned about this will indicate to you whether it may need some assistance. Although 450gms is the minimum weight, many hedgehog carers prefer to get their autumn juveniles up to 600gms (1lb 6oz) or more to give them an extra edge. Autumn juveniles are youngsters found alone under this critical weight after the end of September, and will need extra help even if it is just additional feeding in the garden. If the hoglet is very young (under 160gms/6 oz) it should be given extra warmth with a hot water bottle wrapped in towelling or a blanket, or a heated pad. It should be placed in a box with plenty of clean, fresh straw, crumpled newspapers or old towelling for bedding. Out buildings are fine if heated but don’t put hedgehogs on a metal grid or wire floor or straight onto concrete – they have sensitive feet and cold will permeate through. Why is ‘my’ hedgehog ‘sunbathing’ or staggering? Sick, injured and orphaned hedgehogs are very susceptible to hypothermia. When they become cold they are lethargic and go off their food. This makes them even colder! The staggering (or wobbling and rocking) is a sign of hypothermia, and they may look like they are sunbathing as they spread themselves out in the sun in an attempt to get some heat into their bodies. When they are spotted in this state they need help quickly. They should be taken indoors on a box with a well-wrapped hot water bottle placed underneath them. The bottle must not be allowed to go cold or it will undo the good it has done. Once you have the hedgehog settled and warming up, call the British Hedgehog Preservation Society on 01584 890 801 for further advice. If feeding wild hedgehogs in your garden then a shallow (non-tipping) dish of chicken-based cat/dog food, along with a shallow dish of water, put out each night will help them enormously. A good hedgehog diet would include tinned pet food, chopped peanuts (not whole ones) or crunchy peanut butter, raw or cooked meat leftovers, muesli and a small amount of vegetables. Hedgehogs should not be fed on bread and cows milk if they are captive and cannot find other foods; this gives them diarrhoea . Fresh water should ALWAYS be available. Cows milk SHOULD NOT be given. This is the first thought of many people, and may put them off helping a sickly hedgehog. If it is necessary to remove fleas from a hedgehog, then a commercially prepared mite powder suitable for caged birds or chickens can be dusted amongst the spines (taking care to avoid the eyes of the animal) as an adequate treatment, but do not use on very young hedgehogs. Blood-sucking ticks are often found on hedgehogs and after taking their fill of blood, will drop off the host in order to complete their life cycle. Removal of these ticks is a difficult task but can be accomplished by dousing the ticks in olive/almond/cooking oil. Removing these ticks with forceps is to be avoided as the inexperienced may leave the mouthparts and head in the skin that may turn septic. Will my dog/cat get fleas from the hedgehog? Hedgehog fleas are host specific, which means they will not usually live on any animal other than a hedgehog. Not all hedgehogs have fleas. Hedgehogs avoid the coldest times of winter by hibernating, usually between November and early April, depending on the weather. If it is warm enough and there is enough food, hedgehogs do not hibernate at all. click here for a link to a hibernation leaflet. Or if you want information about a specific time of year or month then here is a good link to the hedgehog year. If you would like to read more of my articles under the heading of nature click here. I’ve seen a lot of hedgehogs over the last couple of days and I’m not sure why. Perhaps they are young looking for new territories. At least one of them must be living in my 5 star Hedgehog Hilton that we built a few years ago.